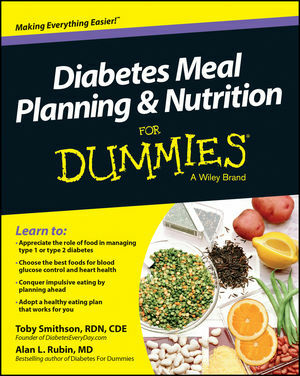 Diabetes Meal Planning and Nutrition For Dummies takes the guesswork out of eating and preparing diabetes friendly foods. You'll learn whether popular diets fit (or don’t fit) into a healthy eating plan, what to shop for, how to eat healthy away from home, which supplements you should consider, and how to build perfect meals yourself. To get you started, this book includes a week's worth of diabetes-friendly meals, and fabulous recipes that demonstrate how delicious food and effective diabetes management can go hand in hand. Toby Smithson, RDN, CDE, has managed her own diabetes for more than 40 years, and founded DiabetesEveryDay.com to share her insights into diabetes self-management. Alan Rubin, MD, is the author of several successful diabetes books, including Diabetes For Dummies and Diabetes Cookbook For Dummies.